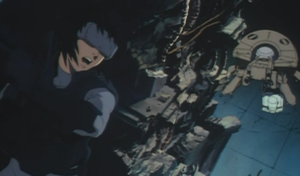 A reader recently compared Steeple to 1995’s Ghost in the Shell, Mamuro Oshii’s hugely popular manga adaptation – and this prompted an insomniac 1am viewing, with the lights off and earphones in. That’s a good way to experience the movie – submerged, isolated, like Major Motoko Kusanagi on one of her diving expeditions, waiting to float to the surface and be reborn. 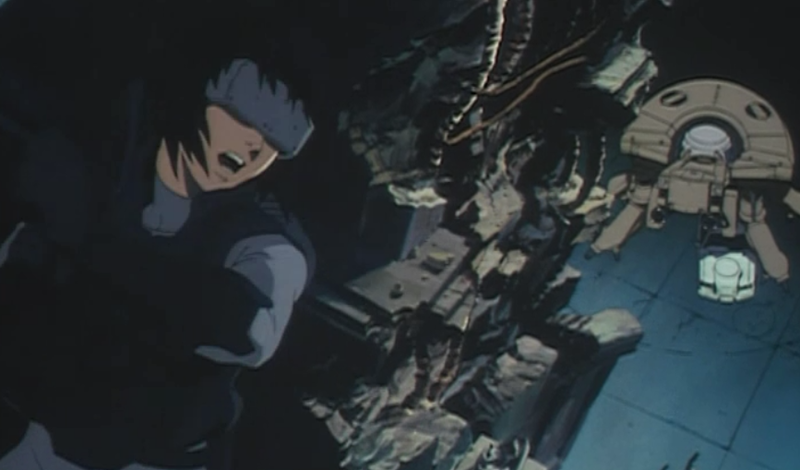 The small hours amplify the movie’s prolonged silences, those dialogue free stretches which help Ghost ascend to something like great cinema – witness Batou and Kusanagi’s pursuit of a suspect through a derelict district, the only soundtrack footsteps in puddles, the hum of the city, a vast aircraft hovering over abandoned towers. The dialogue in Kazunori Ito’s screenplay is a mix of impenetrable clunky info-dumps interspersed with snappy noir-tone lines, but the weaknesses Ito asks viewers to swallow (which must, after all, be taken with a pinch of translation salt) never detract from the script’s ambition, and its skilful interplay of action and ideas. Oshii and Ito’s exciting, gun-toting future espionage adventure easily accommodates a thoughtful exploration of identity in a world where memories are manipulated, faked and used as weapons; where consciousness is a ghost haunting a network; where bodies are more than ever disconnected shells, and gender uncertain. That is quite a trick, and its played out in a beautifully realised world sprinkled with elements of military scifi (got to love that spider tank), intricately detailed city scapes (of brilliant daylight as well as Blade Runner gloom), and a pretty good sense of humour. Most striking of all are the wonderful score by Kenji Kawai, which grips the viewer’s heart from the opening title sequence, and Oshii’s astonishing direction. One long, closing shot in the final scene is like some unnerving, trickster Van Eyk portrait, slowly revealing itself – one of several moments of unique effect. 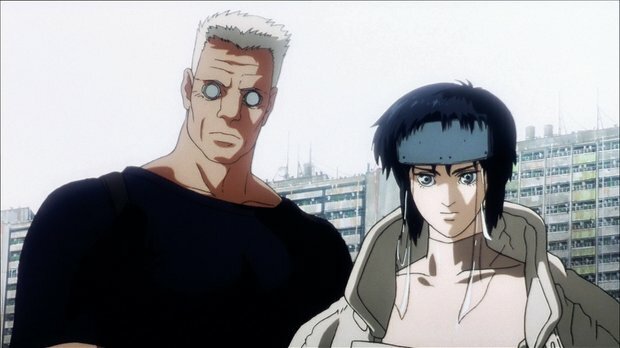 Ghost in the Shell 2: Innocence is written by Oshii alone, without Ito. Interesting. It will have to be viewed soon, on some other lonely, late night. Sometimes it’s the only way to go.